Some acquisitions are really paying dividends, some Olympic participants look drained since the break... San Jose reclaims the top spot. Buffalo, Calgary and Montreal move up. Dallas, Anaheim and Atlanta falter and fall. The Shark have won three straight. Nabokov still doesn't look all the way back after his unceremonious exit from the Olympics, but San Jose has the firepower to overwhelm almost anybody. The Caps are still winning but seem to struggle more lately than what would be expected. Eric Belanger and Scott Walker have been sparkling additions. Give up less than five goals the and Hawks win. 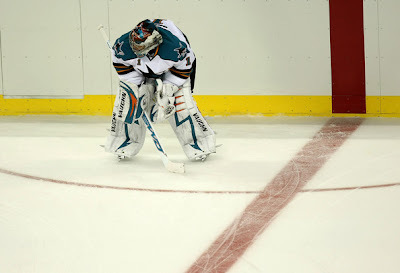 Will goaltending be their downfall in the post season? If Andrew Ladd keeps scoring hat tricks, Chicago has nothing to worry about. Deadline acquisitions Stempniak and Wolski have scored even more than Phoenix had hoped thus far; helping the Coyotes to three straight victories. Headed into Friday, Pittsburgh had yet to lose in regulation since the break. Does coach Bylsma have another magical stretch run and playoff plan ready? The Canucks have been held to less than four goals two times since the break. They lost both games. Should that be a concern? Vancouver is getting loads of offense. Mitchell and Bieksa are noticeable lineup omissions. The Sabres are back after a skid. Winning tight games by scoring just enough to reward Miller for his efforts in net. The Kings have been up and down since the break. Blowing out Dallas and Columbus and also dropping a pair of 2-4 decisions to Nashville and Montreal. Inconsistency is natural with a young team, but it can be a death blow in the playoffs. Chris Stewart has been on fire. The Avs have been beating the lesser teams, but have struggled against better ones. New Jersey entered Friday's game with only seven wins in their last twenty one games, yet there are still very close to the top in the division race. Will they get it together, or will they flop their way into the playoffs? Ottawa was hot going into the Olympic break and have been absolutely frigid after it. Somehow, aside from one night in Edmonton, the Sens have forgotten how to score. Nashville needs to keep the score low, because the offensive slug fests have not been kind to them. When Ellis and Rinne are on, the Preds are nearly unbeatable. The Flames have won four straight! The death threats and letter bombs have subsided at both Sutter households...for now. If Pronger keeps getting abused like he did against Boston, instead of dishing out abuse, Philly fans can just learn to deal with yet another albatross long-term contract. You never know what team will show up each night. The Wings have four of six and are scoring goals. We keep saying it, but who wants to play Detroit in the first round? No team in their right minds. Winners of four straight and five of six since the break, Montreal is way up in the East and in the rankings. The Habs are scoring and could conceivably move as high as fifth in the conference. The Blues had their streak snapped by Colorado, but bounced right back by beating the Isles in an OT shootout. Chris Mason has been quietly having a great season. The B's can't catch a break this season. Just as they start getting healthy again, Savard was literally blindsided by Pittsburgh's Matt Cooke and will likely miss the rest of the season. Even if they hold on to their playoff spot, without Savard, Boston won't last long. What if Carolina had their act together just a few weeks earlier? The Canes have won fourteen of their last twenty. Eric Staal is Eric Staal again and Manny Legace is Martin Brodeur. The Wild have hit a bit of a skid, but no one has instructed Latendresse to stop scoring. Since his trade from Montreal, he has been a force. Gaborik who? Rick Nash is out with injury, but Columbus has won without him. A million letters from Maple Leaf fans have already streamed in to the GM's office offering to take that "bum" Nash off the Jacket's hands. The Stars have been flat out awful since the break. Aside from one heroic performance by Turco against the Caps, Dallas has been getting hammered by opponents each night. The Ducks have yet to win since the break. Fantastic during the Olympics, Hiller has been the opposite since for Anaheim. He isn't getting much help from his fellow Ducks. The Rangers entered Friday's game losers in four straight. Like Hiller, Lundqvist has struggled lately. When the Rangers play defensively, they cannot generate offense at all. When they freewheel, they can't stop the opponent from scoring. The Panthers had won three straight before getting shut out in Colorado. Florida is one of the league's most frustrating teams. They have loads of young talent, but have far too many stretches where you would never know it. Tampa hasn't won many lately, but Steven Stamkos doesn't stop trying. Barry Melrose, you were wrong! After winning their first two in March, Atlanta had lost four straight entering Friday's game against the Rangers. Their offense has been M.I.A. during that stretch. They were shut out by Carolina and managed only one goal against both Nashville and Columbus. The Isles beat Chicago, but then have lost four in a row. Just as they were early in the season, the Isles battle and keep it close nearly every contest, but come out on the short end far too often. It's scary to say, but this team may be just a player or two away from actually being pretty good! Winners in three of their last four, the Leafs keep teasing their faithful fans. It really doesn't matter does it? The rest of the way, all they can do is limit the Bruins chances at the top two selections in the draft. It's been a long, strange, season-long experiment to test if Jeff Deslauriers can actually play... and he can! Yet, the rest of this crew is under some question.